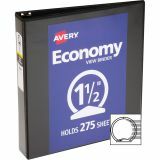 Avery Economy 3-Ring View Binder, 1 1/2" Capacity, Round Ring, Black - Discover sturdy simplicity in a convenient and lightweight package. 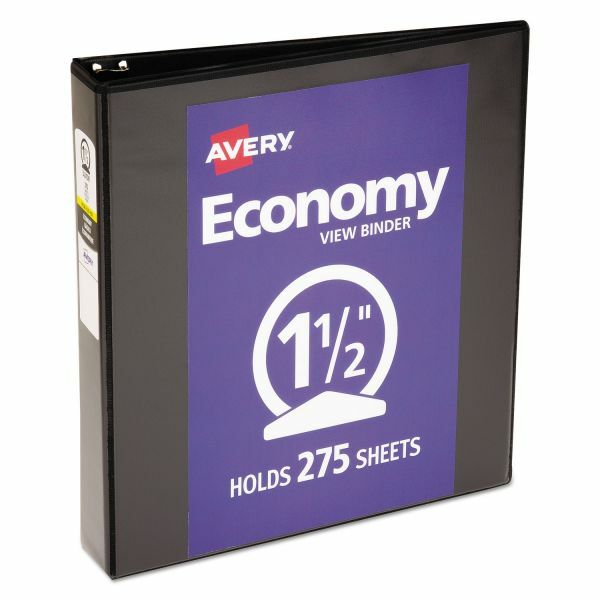 This Economy View Binder offers a handy solution to your organization needs. Open and close the rings with ease to add or remove papers as needed. 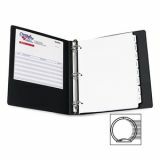 Tuck important handouts, pamphlets and other loose or unpunched paperwork into the two interior pockets for quick access. 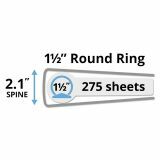 Each pocket holds up to 20 sheets. 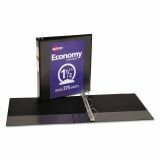 Put your personal stamp on the binder by designing a customized cover and slipping it into the overlays on the front, spine and back. You can find inspiration in the free, easy-to-use templates available online. 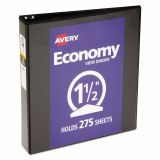 Binder also features vinyl construction, a sturdy chipboard core and exposed rivets.